Believe or not, WWE Studios has pumped out three films in "The Marine" franchise already – starring pro wrestlers John Cena, Ted DiBiase (Jr.), and Mike "The Miz" Mizanin, respectively. But there's at least one "name actor" as well attached to each of them: Robert Patrick, Michael Rooker, and Neal McDonough do the honors. Even if you don't necessarily know their names, you'll probably recognize their faces from a variety of action franchises and other film projects. band of jewel thieves, led by Rome ("T2's" Robert Patrick). Then the chase is on through the back-roads and swamps of South Carolina. Cena is okay, if a bit stiff at times. He comes across as sort of a low-rent Channing Tatum. But Robert Patrick has a blast chewing up the scenery. If Oscars were handed out for Actors Who Make The Most of a Bad Situation, Patrick would have a dozen statues on his mantle. In pro wrestling, there's something called "no-selling." It's when a wrestler doesn't properly convey the effects of an opponent's "painful" move. "The Marine" is full of no-selling. 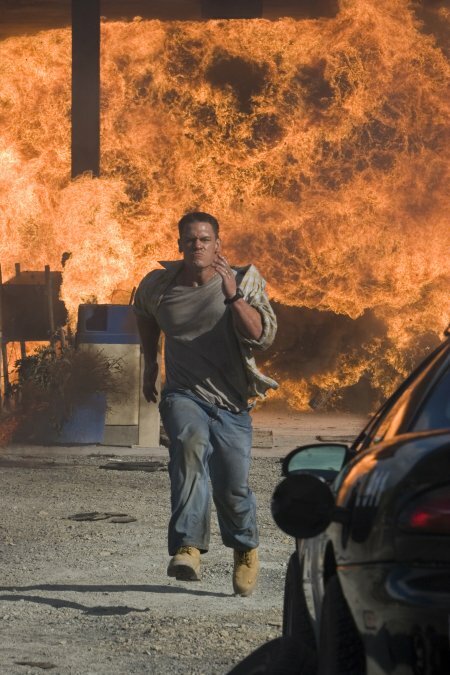 In one particularly ridiculous scene, there's a massive explosion and Cena's character emerges without even a scratch. I suppose that's the cinematic equivalent of getting up shortly after being plastered over the head by a steel chair – without a drop of blood evident anywhere. Action movies aren't exactly known for their realism, but Cena's Superman antics are too much, even for something like this. Then again, his wrestling matches are the same way. "The Marine" is a silly dud, but it's almost worth seeing just for Robert Patrick's exuberance. He goes all out – joyfully putting everything he has into what he must know is a pretty bad script. A marine comes home from duty and goes on vacation with his wife, only for her to end up in grave danger. Sound familiar? Thankfully, Ted DiBiase (son of wrestling's famous "Million Dollar Man") has been cast as a different character. DiBiase trying to play Cena would have been a disaster. This time, the action is set in an overseas Asian resort run by an arrogant American self-help writer (Darren Conner). Robin Linwood (Lara Cox) works for him. She and her husband, Joe (DiBiase), vacation there for its grand opening. They soon run into another American: an ex-Army Airborne Ranger who calls himself Church (Michael Rooker). At first he seems a bit unhinged, which made me wonder if the movie was setting him up to be the villain. He would certainly be a worthy follow-up to Robert Patrick. Alas, we aren't quite that lucky. Instead, the villains end up being a generic group of local terrorists who are rebelling against "The Great White Hope" Americanizing the area with an opulent resort. In a different kind of movie, this might have been an interesting message to explore. Obviously, in direct-to-DVD action fare like this, there's no time to dwell on the socio-political ramifications of America's growing influence on foreign nations. It's up to the Marine to save the day and rescue his wife, her boss, and assorted other hostages. DiBiase isn't the most dynamic, charismatic actor, but he is natural and likeable. That's more than many of his wrestler-turned-thespian colleagues can say. That doesn't mean he's perfect though. In one scene, a torture sequence, he's required to raise his voice – and it sounds like he's channeling the cheesiness of Hulk Hogan. There's also a fight so obviously choreographed that it looks more like a dance number, complete with corny music. Still, DiBiase isn't bad at all – and neither is the movie, surprisingly. It's very reminiscent of the type of flick that was churned out en-masse in the 1980s. It does drag in spots, but for the most part, it's simple but effective and actually kind of fun. It's just a shame that the villains are so dull. Wrestling is built on good guy vs. bad guy, and both sides have to be strong and entertaining. It doesn't work otherwise. Action movies are the same way. If Robert Patrick's crazed character from the first movie had been in this one instead, "The Marine 2" might have risen above the obscurity of the bargain bin scrapheap to become somewhat of a minor action hit. In the third installment of this series, a Marine returns home and ends up having to rescue his youngest sister. Needless to say, "The Marine" movies don't exactly vary their formula too much. 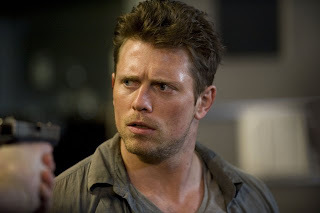 Jake Carter (Mizanin) is overprotective of his two sisters, Amanda (Camille Sullivan) and Lilly (Ashley Bell), and has a hair-trigger temper. It is hard for him to make the transition from the combat zone to civilian life. 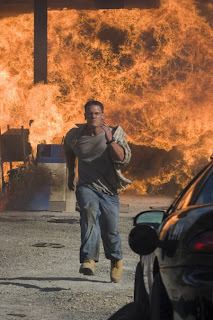 Meanwhile, a psychopath bomber, Jonah (Neal McDonough, who previously opposed The Rock in "Walking Tall") is on a murderous rampage against greedy banks and corporations. Like "The Marine 2," a weighty political topic is introduced but never really explored on any serious level. That's perfectly okay though because it's par for the course in an action movie like this. Ashley and her boyfriend, Darren (Jeff C. Ballard), witness a murder involving Jonah and his goons. Of them, Eckhert (Michael Eklund) makes the most of his minutes, creating a deranged but compelling character. The two lovebirds are spotted and taken, and it's up to Jake to come to their aid. Standing in his way are the chief of police, Harkin (Jared Keeso), who is also his best friend, and a territorial FBI agent, Wells (Steve Bacic), who definitely isn't his best friend. Mike "The Miz" Mizanin is by far more comfortable and convincing in this type of role than either DiBiase or Cena. He comes across as a regular guy who just happens to be highly trained. By the end, he's bloody, bruised, and beaten down. It's a refreshing and realistic change from Super-Cena in the first movie. McDonough makes a credible villain. He takes the role seriously and conveys a nice mixture of intensity and calm. It's a very different performance from Patrick's in the first film, but it's just as good in its own way (and it's certainly miles ahead of the generic drones in the second). Mizanin actually wasn't the original choice for the part. Stiffer-than-a-board pro wrestler Randy Orton ("That's What I Am") was initially cast – until complaints of his real-life dishonorable discharge from the Marine Corps surfaced. He was then dishonorably discharged from the movie, and before he could "go to the papers" about it, he was replaced by The Miz. At the time, plugging Miz into the role seemed like a major head-scratcher. He was portraying a very weak, whiny, devious little mouse on WWE TV. He even sported a completely ridiculous chicken-hawk hairstyle. A manly Marine he was not. But that disparity is what initially interested me in the movie. Cast against type and seemingly illogical for the role, it was bound to be a big stretch for Mizanin. I was curious to see how – or if – The Miz could pull it off. To his credit, he transformed himself completely with a more rugged look (which he later retained for his wrestling persona) and made it work. Not only is he good at portraying a Marine, he's even better than his predecessors. These aren't great films, but the two "Marine" sequels have their charms. This may be the only instance of a series that actually gets better with each progressive installment. The best part is that you don't even need to see all three to get the full picture. They're similar thematically but otherwise unrelated. You're safe just picking whichever one sounds good to you – if any of them do, that is. A certain segment of the population still laps up those cheesy straight-to-video flicks starring Steven Seagal or Jean-Claude Van Damme, even though they're both twenty years past their prime. 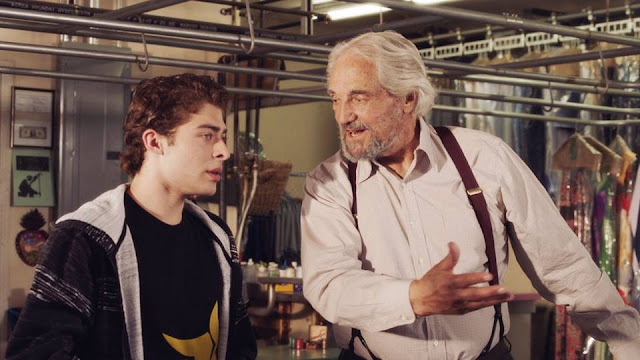 WWE has the right idea inserting its young, athletic wrestlers into similar types of films. At least the WWE superstars are more convincing visually, and the acting and scripts are no worse than any of the other run-of-the-mill action movies produced today for home video. In some ways, they're a little bit better. The "Marine" movies won't be confused with "Skyfall," "Die Hard," or any of today's big budget Hollywood extravaganzas, but they do serve as a slightly superior alternative to the latest bargain bin entries from Seagal, JCVD, and other aging action heroes from the '80s.